interpretation of substantive patent law in actions under the IP Enforcement Directive. 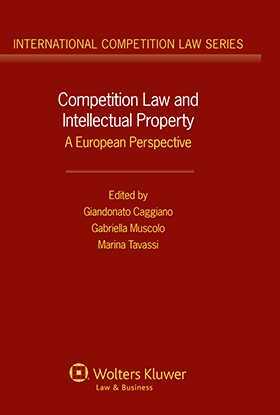 As a detailed analysis and clarification of one crucial way – that of intellectual property rights regulation – in which the concepts and principles of competition law are internalized through mechanisms for the gradual opening up of markets, this book clears new ground for steps forward in an essential area for EU growth and development. It will be of great value to lawyers, academics, and policymakers in both fields. Chapter 1 Competition and Regulation of Intellectual Property Rights for the Achievement and Functioning of the Internal Market. Giandonato Caggiano. Chapter 2 The Bride and the Groom. On the Intersection between Intellectual Property and Antitrust Law. Gustavo Ghidini. Chapter 3 Intellectual Property Rights and Merger Control: How to Secure Incentives to Innovate in the Long Run. Andreas Heinemann. Chapter 4 Oligopoly and the Prisoners’ Dilemma: How About Intellectual Property Rights? Mario Franzosi. Part II IPRs and Standardization. Chapter 5 Standards under EU Competition Law: The Open Issues. Ginevra Bruzzone & Marco Boccaccio. Chapter 6 The Interplay between Standardization, IPR and Competition Law. Ian S. Forrester, QC. Chapter 7 Case Note: Some Thoughts on the Rambus Case – Patent Ambush on Two Sides of the Ocean. Cristoforo Osti. Chapter 8 Group Innovation and Patent Pools: The Role of the Courts – The Balance between Competitiveand Anticompetitive Effects. Gabriella Muscolo. Chapter 9 Negotiated Foreclosure and IPRs: Recent Developments. Pier Luigi Parcu & Maria Alessandra Rossi. Chapter 10 The EU Pharmaceutical Sector Inquiry. New Forms of Abuse and Article 102 TFEU. Mario Siragusa. Chapter 11 Industrial Property and Abuse of Dominant Position in the Pharmaceutical Market: Some Thoughts on the AstraZeneca Judgment of the EU General Court. Ilaria Ottaviano. Chapter 12 Competition Law and Copyright: Observations from the World of Collecting Societies. Ingo Brinker. Chapter 13 New Levels of Protection for Shapes: A Consideration of Three-Dimensional Trademarks and Registered Models. Lamberto Liuzzo. Part IV General Competition Issues Relevant to the Subject Matter. Chapter 14 Single-Firm Conduct: A Discipline in Search of Itself. Roberto Pardolesi. Chapter 15 Estimating Damages to Competitors from Exclusionary Practices in Europe: A Review of the Main Issues in the Light of National Courts’ Experience. Luigi Prosperetti. Chapter 16 Intellectual Property and Refusal to Deal: ‘Ad Hoc’ versus ‘Categorical’ Balancing. Francesco Denozza. Part V Comparative Law Perspectives. Chapter 17 Exercise of Patent Rights under Japanese Anti-monopoly Prevention Law: A Comparative Law Perspective. Toshiko Takenaka. Chapter 18 A Primer on Competition and IP Law: A US-EU Perspective on Private Enforcement. Rebecca Spitzmiller. Part VI National Law Insights. Chapter 19 The Relationship between IP Rights and Competition: Report from an Italian Point of View. Marina Anna Tavassi. Chapter 20 Antitrust and Intellectual Property: Reflections on the Experiences of AGCM. Carla Rabitti Bedogni. Chapter 21 The Jurisdiction of Italian Judges in Enforcing Antitrust Law: Problems and Solutions. Enrico Adriano Raffaelli. Chapter 22 Developments in Competition Law in the English Courts. Vivien Rose. Chapter 23 Report on Competition Law Enforcement in the United Kingdom. The Hon Sir Gerald Barling. Chapter 24 The Swedish Asphalt CartelCase. Christer H. Fallenius. "The articles included in the volume provide a comprehensive overview of the topical matters at the intersection between IP and competition, focusing on questions that are particularly relevant in the European context, such as the incomplete harmonisation of IP Laws at EU level and divergent national enforcement traditions. The thoughtful comments of the authors will be of great value to academics, practitioners and policymakers both in the field of IP law and in the competition law field."